EVERYONE else will be nervous too. EVen if they're wearing tutus. Have a big drink the night before. Not beer, not wine ... in fact nothing alcoholic. Water - good. Squash – good. Vodka - BAD. Give yourself plenty of time. Have breakfast – but at least 2 hours before the race starting time otherwise you might give yourself a stitch. Have another big drink of water. This is IMPORTANT. Have a poo. No really. I can’t stress how important this is. You really do NOT want the ‘I need a poo’ feeling on the start line or even worse halfway through a race. Plus, you really do not want to ignore this feeling when you’re running. TRUST ME on this. Get there early. So you’ve got time if you get a puncture, time to locate another number if you’ve forgotten yours (mug another runner), have a coffee. And have another wee. Take SPARE safety pins. One will always get lost or break. Or be covered in Calpol. You don’t want your number flapping around so the photographers can’t identify you. Also don’t mess about with your number like cutting it smaller or folding it in. The race sponsors will get REALLY shirty if you do this and you may be disqualified. At least one of these will break while pinning a number on. Guaranteed. Race pens / start line. The fast guys go at the front, the slower people at the back. Obvious right? Yet there’s always some slow person at the front getting trampled by the faster people and holding everyone up. Don’t be that person. 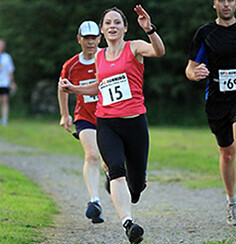 Have a look at the race results from last year so you know where to stand. Alternatively some big races have pens with the pace or the time you’re looking to do written on them. Use these. There’s usually a warm up. Yes you will look a wally. Yes EVERYONE will look a wally. But hey, at least we’re all being wallies together. Right? Worth taking advantage of this. If only to laugh at the other uncoordinated people. Wear a bin bag. You will have left your jumper in the car, the baggage area or wherever. You WILL be bloody freezing even if it is July. A bin bag is the solution. Don’t worry about looking a plonker. Everyone wears these. Just make sure you cut head and arm holes otherwise you will suffocate. Then you definitely won’t get that PB. Be at your pen early as time is distorted before a race. You’ll have 45 minutes before the start time, then 30 seconds later this will be 5 minutes. Time really doesn’t work properly before a race. Baggage Storage. This works in 2 ways. Either you’ll leave your kit in a tent with your race number on (you might get a blank tag with your race pack to fill in with this) or the luggage storage will be in a lorry which they’ll drive to the finish for you. This will be free of charge. Have a pen. I ALWAYS need a pen. Either I’ve forgotten to fill out the back of my number or I need to write something down. Race pack. This will either come out to you in the post or you will pick this up before the start of a race. If it is before the start of a race, make sure you leave plenty of time as the queue can be horrendous. The race pack typically contains your race number, maps on how to get to the start of the race and if you’re extremely lucky some safety pins. For the bigger races you may get a ‘chip’ which is usually a plastic circular disc that you tie through your laces and which records your times over the line so they’re more accurate. Loos. Usually portaloos. The queue for the loos isn’t so horrendous early on. It gets bad just before the race when Nervous Bladder kicks in. And after queueing for 20 minutes you’ll finally get into a portaloo and realise there’s no loo roll. And the race starts in 5 minutes. Not good. Also other people will have what I delicately title The Nervous Shits. You do not want to go in a portaloo after these people. Get there early. Be nice. Be nice to your fellow runners as it’s likely they will running at the same pace as you if you started in the same pen. People DO remember elbows in the ribs and squashed feet – even in the melee at the start of a race - and they might not be so likely to share their water or gel with you if you smacked them in the head to get a fast start off the line. Ballot entry. Some of the bigger races are using this form of entry such as Virgin London Marathon. The race gets such a large number of entries, they can’t let everyone run. They get around this by doing the equivalent of drawing applications out of a hat. With London, you apply in April and usually hear whether you’re in by October. Or you can apply to run for a charity but you have to promise to raise a set amount of money for them usually around the £2k mark. Yes £2k. You can also get in with a ‘Good For Age’ time which is where you run a similar distance race in under a set time and you can apply to get in to the next year’s marathon without having to enter the ballot. Headphones are PROGRAMMED to get tangled. Headphones. This is one topic guaranteed to get even the most mild mannered runner seething. The camp is divided fairly evenly between people who use these and people who don’t. Personally, I find that I’m more aware of my surroundings without these and am less likely to be trampled by a faster runner who I didn’t hear coming and more aware of the cheers from the crowd, but it’s all down to personal preference. Just don’t use them during the safety briefing at the start of a race as you might miss the warning about the vicious dogs, pot holes or pit of spikes.